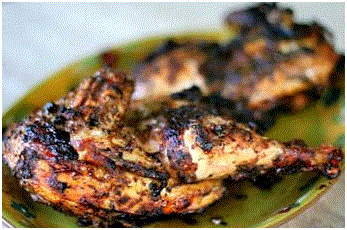 The Jerk Chicken is a really tasty meal it is tasteful if we serve it with salads. This is very nice and cool food it’s amazing taste must be liked by everyone. Put vinegar, hot peppers, onion, green onion, thyme, olive oil, salt, pepper, mix spice cinnamon, into a blender. Blend all ingredients. Place chicken in a large freezer bag, or in a large roasting pan or baking dish. Sprinkle lime juice over the chicken and coat well. Add the jerk paste to the chicken pieces and coat well. Seal the bag or cover the chicken in the pan with plastic wrap. Refrigerate overnight. When you are ready to cook the chicken, remove chicken from the marinade bag or pan. Put the remaining marinade into a small saucepan. Bring to a boil, reduce heat and leave for 10 minutes. First of all preheat grill on high temperature. Sprinkle chicken with salt and pepper. Place chicken halves, skin on the grill grates. Cover. Cook for approximately one hour., keeping the internal grill temperature between 350°F and 400°F.The chicken is done when the juices run clear when a knife tip is inserted into both the chicken breast and thigh, about 165-170°F for the breast and 180-185°F for the thigh. Place the chicken on the dish. Keep loosely with foil to keep warm and let stand 15 minutes. Preheat oven to 350°F. Place chicken round baking pan, skin side up. Roast until chicken halves are cooked through, about 50-60 minutes. The chicken is done when the juices run clear when a knife tip is inserted into both the chicken breast and thigh, about 165-170°F for the breast and 180-185°F for the thigh. Transfer chicken to dish. Wrap with foil to keep warm and leave 15 minutes. Cut chicken into pieces. Serve with salads and rice.